All it took was a single phone call to turn Janie’s simple, orderly, comfortable existence into a chaotic, messy, co-habitation with her gregarious, dramatic, and - thanks to modern surgery - more bountifully endowed twin, Rachel, and her smelly pet ferret, Nostradamus. Ryan and Janie are co-workers at The Big Easy News where they both report to their dragon-lady boss, editor-in-chief, Jacqueline Reddy. Janie finds Ryan quite attractive and vice versa but neither one has attempted to establish a personal relationship since dating amongst co-workers is strictly against office policy and is grounds for termination. Ryan also happens to live just downstairs from Janie in the same apartment building. As the story opens, Rachel is in the process of breaking up with her loser boyfriend. Janie agrees to let Rachel take up temporary residence with her until Rachel can sort things out and decide how she wants to move on. The mayhem ensues as the intellectually-minded, neatly-organized Janie and her free-spirited, mouthy, colorful sister try to adjust to living together after having lived separate and very divergent lives for years. Hilarity abounds as the cast of secondary characters make their appearances, some wrecking havoc and some bearing gifts. I was absolutely, totally charmed by this thoroughly entertaining novel. The several important characters are all exceptionally well-developed with identifiable characteristics and quirks. The conversations sparkle with humor that is fresh and believable. The story, told from Janie’s perspective, in first person, is fast-paced and flows smoothly to a joyfully satisfying conclusion. I love Nostradamus; the naughty little scene-stealer also stole my heart. Time flew by as I quickly turned the pages to find out what would happen next. I applaud the author for penning such an original, outstanding tale and highly recommend this fun urban adventure romance to anyone who craves a little Magick. 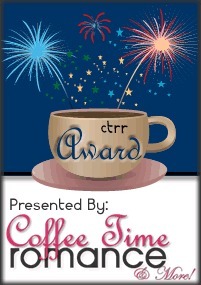 Coffee Time awarded Magick Charm their CTRR Award! I couldn't be more thrilled! Book Release Party for Magick Charm!